Untapped oil deposits and new technology could result in a massive production increase in the Last Frontier. Once a major producer and cog of economic growth, Alaska now accounts for only a small fraction of total U.S. crude oil output. 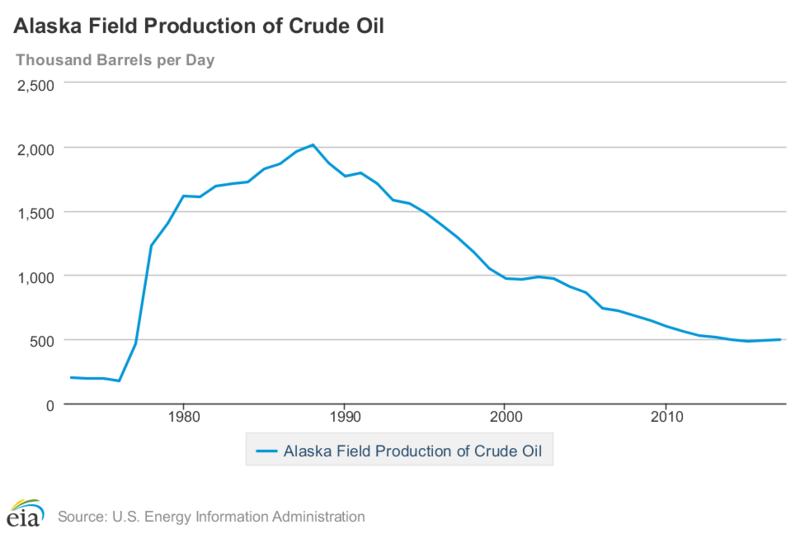 Alaskan oil production has been in a downfall. Since peaking in 1988 when Alaska accounted for 25 percent of U.S. domestic production, the state now produces only 7 percent of U.S. domestic crude. The oil industry accounts for one-third of Alaska jobs and about one-half of the overall economy yet production is 8 percent lower than the same time last year. Many Alaskans have been weary of their state's dependence on oil. Oil was often produced at any cost to the environment, the state was over a billion dollars in debt, the Trans-Alaska Pipeline System was running dry and the oil fields have been facing massive layoffs. But, the future is turning brighter. A recent research report found that crude oil production from the late-stage Alaska North Slope could increase by 40 percent. Companies recently found massive untapped oil deposits in Alaska that could be accessible through fracking. Besides the new discoveries, optimism is increasing because the Alaska North Slope now has fewer barriers to entry for operators, making it more competitive. Advances in new drilling technologies, incentive programs for accelerated permits from the state, and infrastructure investment make this largely onshore conventional basin ripe for exploration. Major oil companies like ConocoPhillips (COP - Get Report) are purchasing Alaskan land and developing cost-effective methods of fracking in remote regions. The Trump administration recently released an important permitting document for a big ConocoPhillips oil field in Alaska. In fact, Conoco is forging ahead on their planned multibillion dollar Willow oil development in the North Slope and they have made it clear that they plan to continue exploring in the area. It is estimated that fracked Alaskan oil could be profitable to drill at just $50 per barrel, which is now significantly under current crude prices. The project calls for initial oil in 2021 with peak production of about 38,000 barrels daily by 2025. In addition, the Trump administration also has plans to open up the Beaufort and Chukchi seas to offshore drilling, reversing an order largely making those areas off-limits to drilling. In addition to ConocoPhillips, new production is also expected to come from ExxonMobil (XOM - Get Report) , Oil Search (OISHY and Eni (E . These companies are rapidly expanding their exploration in onshore reservoir trends into the shelf area, which is just three miles off the Alaskan coast in the Beaufort Sea. This activity is a leading indicator of a new Alaskan Oil Boom.